Vice President Mike Pence walks in the hallways of the U.S. Capitol in Washington on Tuesday. WASHINGTON — Divisions grew among congressional Republicans on Tuesday over President Donald Trump’s shutdown strategy, as a number of lawmakers expressed consternation over the possibility that he’d declare a national emergency to build his border wall, while others voiced some support for Democrats’ plans to reopen most of the government without the wall money Trump has demanded. Ahead of a nationally televised address by Trump, Vice President Mike Pence lobbied House Republicans behind closed doors to stand with the president, reminding them that Trump would not sign any spending bills passed by Democrats unless he gets the wall funding he wants and urging them to reject the Democratic strategy. 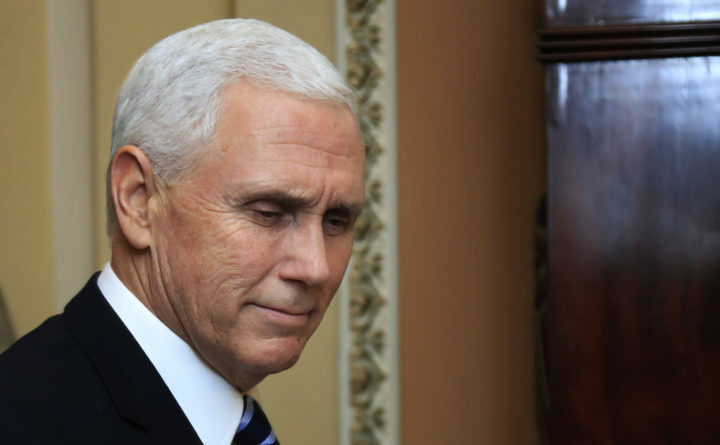 But in a potentially perilous sign for Trump on the 18th day of the partial shutdown, cracks were multiplying within GOP ranks even before Pence ventured to Capitol Hill late Tuesday. The dissension was especially evident over whether Trump should declare a national emergency that would allow him to circumvent Congress and draw on military construction funds to build his wall, with some normally reliable supporters voicing concerns over the approach. Opposition also came from members of the House Armed Services Committee, who voiced concerns over cannibalizing the military budget to pay for the wall. The GOP fissures suggested that Trump’s showdown with the Democrats had entered a new and politically perilous phase. While Trump has largely maintained loyalty among Republican lawmakers, at least until now, additional GOP defections could isolate the president and force his hand on reopening the government without delivering on his signature campaign promise — a potentially embarrassing outcome for a businessman who presented himself as a master negotiator. Pence’s presentation failed to quiet concerns from some Republicans who would like to see most of the government reopen while the fight over the border wall continues, an approach Democrats will attempt anew starting Wednesday by putting a series of spending bills on the House floor to fund shuttered agencies. “My positions haven’t really changed,” Rep. Will Hurd, Texas, who was among around a half-dozen Republicans who broke ranks last week and voted with Democrats on an earlier spending bill to reopen the government without funding Trump’s wall, said after hearing from Pence on Tuesday night. “Shutting down the government is never a good idea,” Hurd said. Rep. Steve Womack, R-Arkansas, said that although he would vote against the Democrats’ bills, it was “hard to say” whether the House GOP conference was unified around that stance. “We’ve got some people that may be predisposed to voting for the individual bills that are going to come up to reopen portions of the government, but we’ll see,” Womack said. In the Senate, Shelley Moore Capito, R-West Virginia, a senior member of the Appropriations Committee, noted that lawmakers remained far apart on the Homeland Security spending bill that funds the wall, so “Eventually maybe we go to the ones that are already settled, pass those,” while continuing to negotiate on the Homeland Security bill. “Those bills, some of them have been passed all the way out of the Senate, some of them have just been passed through the Appropriations Committee. I would imagine it could happen very quickly. I want the government to reopen,” Capito said, adding she wanted to hear what the president had to say first. Trump has demanded $5.7 billion to build more than 200 miles of a wall along the border with Mexico, while Democrats have refused to offer more than the current funding level of $1.3 billion for border barriers, a standoff that resulted in a partial shutdown of the federal government beginning Dec. 22. As a candidate and earlier in his presidency, Trump promised the border wall would be paid for by Mexico. That has not happened. Continuing the administration’s pressure campaign on Republicans, Trump planned to address Senate Republicans at their weekly lunch Wednesday. Later Wednesday, he was to meet with top congressional leaders of both parties at the White House for another round of negotiations that have thus far failed to produce results. In recent days, administration officials have begun describing conditions at the border in crisis terms, an argument that Pence, acting White House chief of staff Mick Mulvaney, Homeland Security Secretary Kirstjen Nielsen and others repeated in their closed-door meeting Tuesday with House Republicans. Negotiations have broken down as the impasse has continued with no end in sight, leading Trump to float the idea of declaring a national emergency, relying on a law would allow the defense secretary to order military building projects, drawing on funds already appropriated by Congress. “The president has made very clear that he is considering that. He has the right to do it. He has said his legal counsel are looking at it,” presidential counselor Kellyanne Conway said as she left the meeting with House Republicans, where the issue of a national emergency was not discussed. The fact that defense funds would have to be taken from other projects if a national security were declared emerged as an immediate hurdle for some Republicans on Capitol Hill. Other GOP lawmakers in both the House and the Senate said that Trump needed to explain more clearly what he had in mind before they could offer their support. Sen. John Boozman, R-Arkansas, said that people had different interpretations of whether Trump had the authority to declare a national emergency in this situation. Democrats have already warned repeatedly that such a declaration would be challenged in court.